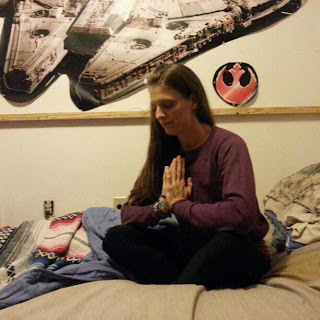 Barefoot Angie Bee: December Yoga Challenge. Find some daily balance. 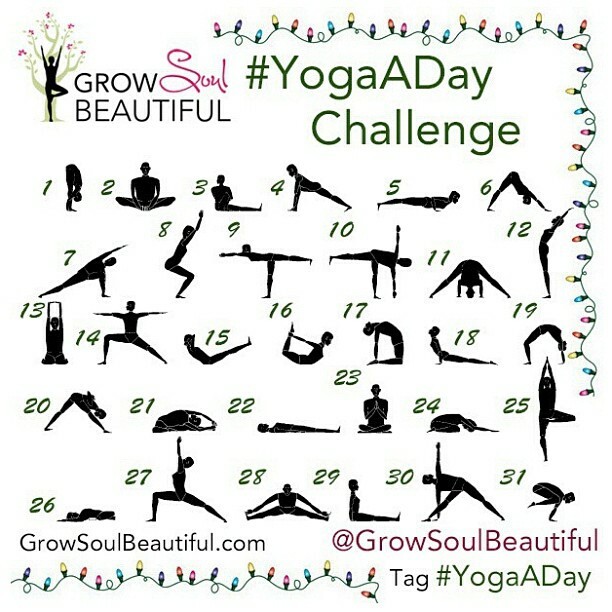 December Yoga Challenge. Find some daily balance. 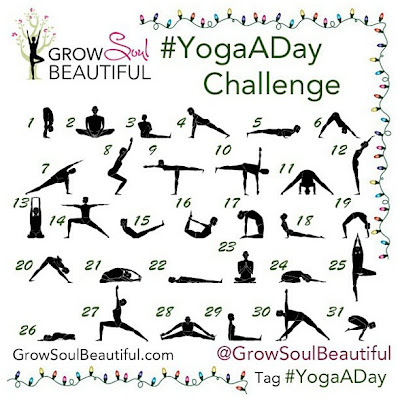 Grow Soul Beautiful has posted the calendar for December's challenge! 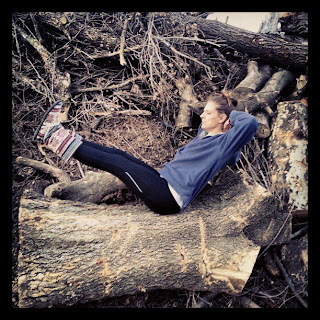 This is a great way to learn more about yoga and to meet some lovely people on instagram. You can also post your pictures to twitter or Facebook. It doesn't have to be on instagram although you will be able to search for the #yogaaday hashtag to get connected. On my Barefoot Angie Bee Facebook page and Twitter @BarefootAngieB, I post a video every day, that I get from Youtube, with instructions as to how to do the days pose. These are some of my favorites from November. Get creative and have some fun! The Easy Pose is indeed not so easy for me! My hips do not like moving in those directions. 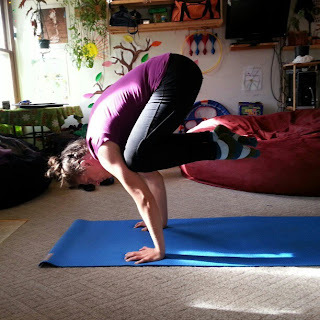 Hip openers are my most profound and frustrating teachers. Yoga with kids is a blast! I like them seeing my example and I feel better the whole day if I get at least a little bit of yoga done in the morning. Even one Sun Salutation is enough on the days when thats all I can get in. 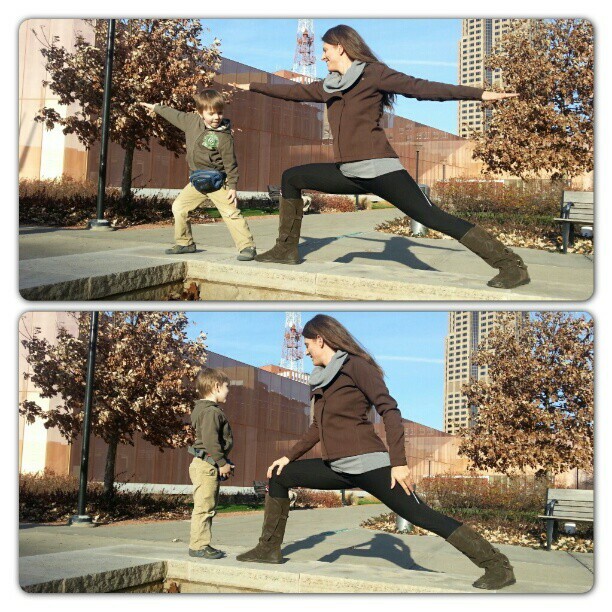 The Boat Pose is an awesome core strengthening pose! One of my very favorite poses. Where my legs and hips lack in stretch my arms make up for in strength! Its all about balance and breathing, and having a good sense of humor when you sometimes fall on your face. Make sure and post the bloopers too! I so need to do this. However, I think people with kids should trade the pose on Christmas with the pose on the 22nd! It's been so cool watching your progress and I love how the kids get involved! I love seeing your pictures and everyone else's for this challenge. It's so great to see the creativity as well as to see all the different levels of yogis out there! I too love how you get your kids involved. I went to their site and didn't see anything about December. All still November. Also, I don't get how you post on Instagram and tag things. On my profile page (my photos), I see how many I am following, but I cannot actually click on anything to see any photos of those I follow nor can I see who they are or who is following me. It's a bit weird or not well-implemented. I am havign shoulder impingement trouble right now. I want to do all of these!!! Can I do it without messing myself up further? That last one is insane! I want to try that just to see how it goes!! I love your pictures! I too enjoy seeing the different levels and the bloopers pics are so fun! I was looking at instagram after reading your post earlier and was wondering if you use the iphone app or android? I have used both and they have been the same for me. If you go to your profile, on the top right there are the number of followers and a number of those you follow. Click on those to see a list of actual people. Also the compass rose at the bottom is where you search and you can search people with the @ or hashtags with the #.. Message or email me if you need help. I use youtube a lot for finding out the instructions for poses and if you search for "modified" and then whatever pose I bet you will find ones that will keep your shoulder safe. Thats a tough one since the poses can also strengthen and bring balance but there is also the risk of injury so ultimately you will have to decide based on each pose. I think there are a lot of them that would be just fine though. I love doing yoga with kids. I feel better the whole day after the Sun Salutation that i do in the mornings. That crane pose is pretty tough but very effective.